How Do You Playback Audio to Voice Over Clients? 2.) Solid USB Interface with nice converters. They’re same ones found in Steinberg interfaces: yes, Yamaha makes those. 3.) Ability to playback any computer audio source to a director/client (including your DAW) without extra routing. Just press the red button on channel 9/10 when you need to play audio down the line. I added it to my voice over studio because I wanted a 2-in/2-out USB interface like the Focusrite Scarlett but with better preamps. Unfortunately with Scarlett interfaces, even when one goes line-in from an external preamp on the bigger Focusrite models, the audio still goes through the Scarlett preamp. That’s not terrible, but I wanted something better, with the ability to run a gentle 80 Hz HPF as I recorded if possible. The MG10XU mixer is an audio interface and preamp all-in-one. And yes, the preamps, conversion, and playback all sounds better than the Scarlett. As a bonus, it’s not huge or heavy, and can fit easily in a briefcase for travel. But this isn’t just a Yamaha mixer, it’s an invaluable voice over tool. You can playback any audio source from your computer to the client without doing any routing tricks. The 9/10 Channel controls the playback from your computer…and it goes right back down the main output as long as the red button on that channel is switched from Monitor to Stereo output. So anything you just recorded in ProTools or Audition you can just cue it up and play, and control the output with the volume pot. Any streaming sound from YouTube or Vimeo can go down the line too. This works with all the remote recording solutions like Source Connect, ipDTL, Skype, and SessionLinkPro. If the client can hear you, they will hear the playback on command. 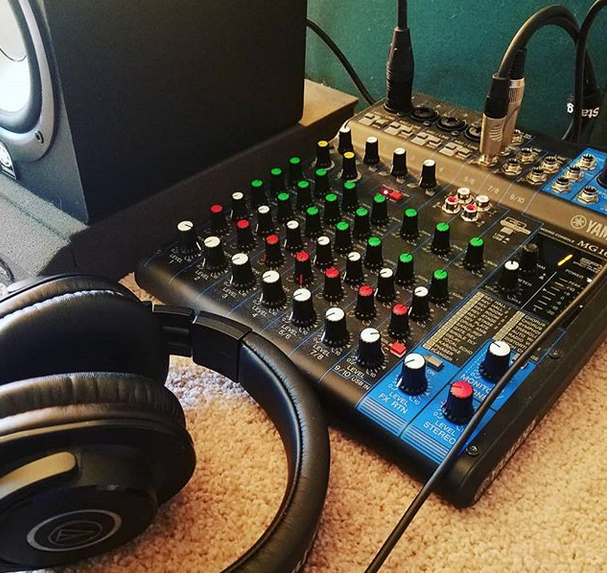 Update: I discussed this with voice over tech guru George Whittam and he said that the Yamaha AG03 also has this ability in a smaller travel-size mixer for half the price. If you don’t need the extra inputs and additional routing then the AG03 is a great solution also. I think I’ll be getting one for my travel rig!